Type 2 diabetes is a progressive disease requiring gradual treatment intensification. Currently, 50% of patients on basal insulin do not meet their glycemic control targets (Sanofi communicaion – Q3 2015 presentation). To improve glycemic control, the patient may be recommended to add a prandial component to his/her treatment regimen. This can be achieved via the addition of prandial insulin to the basal insulin, or by replacing basal insulin with premixed insulin. Premixed insulin is a fixed combination of a soluble fraction and a precipitated fraction of the rapid-acting prandial insulin. It is usually injected twice per day. It is an easier regimen than multiple daily insulin injections: one product only, twice per day at a fixed ratio, rather than two products, four times per day at variable doses. Premixed insulins are therefore particularly recommended for elderly patients. They are also widely used in emerging markets. However, they do not offer ideal medical performance owing to a delayed and prolonged prandial action, a basal action profile of less than 24 hours and an elevated risk of hypoglycemia. To meet the medical need for a regimen as simple as that of premixed insulin but as effective as a multiple-injection regimen, Adocia has developed BioChaperone Combo, a combination of insulin glargine (basal insulin, Lantus®, Sanofi) and insulin lispro (prandial insulin, Humalog®, Eli Lilly) at neutral pH. For a long time, it was technically impossible to combine the gold-standard basal acting insulin, insulin glargine, and a rapid acting insulin into the same product, as they could not be formulated in the same pH range. BioChaperone® technology makes it possible to solubilize insulin glargine at neutral pH, making it compatible with any prandial insulin. An insulin combo could become a strong option for treatment intensification, providing truly effective basal and prandial coverage. Indeed, patients could intensify their treatment from basal insulin by continuing to inject only once daily with a single product (Combo once-daily) and then, when the disease progresses, by simply adding a second injection of the same product (Combo twice-daily). To date, BioChaperone Combo has been successfully tested in five clinical studies. 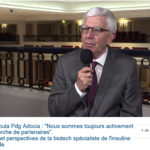 In the first quarter of 2014, Adocia announced positive results for a study that had aimed to compare the pharmacodynamic and pharmacokinetic profiles of BioChaperone® Combo to those of Humalog Mix25™ (insulin lispro premix 75/25, Eli Lilly) in people with type 1 diabetes under euglycemic clamp conditions. BioChaperone Combo showed an onset of action more than 30% faster than that of Humalog Mix25™; and BioChaperone Combo’s duration of action was longer than 30 hours in the majority of patients, while Humalog Mix25™ lasted only 18 hours. Both treatments were well tolerated. In November 2015, Adocia announced topline positive results for a Phase 1b clinical study evaluating postprandial effects of BioChaperone Combo in 28 patients with type 1 diabetes. This randomized double-blind crossover study compared the effect on postprandial glycemia of individualized doses of BioChaperone Combo and Humalog® Mix25™. (Eli Lilly), injected at the start of a standardized meal. The study met its primary endpoint, demonstrating that BioChaperone Combo resulted in a significant -24% reduction of postprandial glycemic excursion during the first two hours (∆AUCBG(0–2h)) compared to Humalog® Mix™25 The minimal blood glucose level observed during the period was also significantly better controlled with BioChaperone Combo vs. Humalog® Mix25™. Although this study was not designed to measure differences in the incidence of hypoglycemic episodes between the two treatment groups, a reduced number of hypoglycemic events was observed with BioChaperone Combo vs. Humalog® Mix25™. 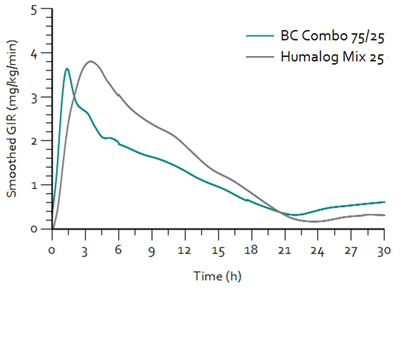 Pharmacodynamic profiles for BioChaperone Combo 75/25 and Humalog® Mix25™. after a liquid meal obtained from 28 people with type 1 diabetes (NCT#02514954). 1 p=3.10-3.2 p=8.10-3. In November 2015, Adocia announced positive Topline results for a Phase 1b study comparing the pharmacokinetic and pharmacodynamic profiles of BioChaperone Combo to those of Humalog® Mix25™. and to the dual injection of Lantus and Humalog in patients with type 2 diabetes. In this study, BioChaperone Combo confirmed similar pharmacokinetic and pharmacodynamic profiles in people in type 2 diabetes to that observed in people with type 1: BioChaperone Combo showed a significantly superior early prandial action and a longer metabolic effect compared to Humalog® Mix25™. Furthermore, this study also established the proof-of-concept that BioChaperone Combo has a similar effect to that of the dual injection of Lantus and Humalog on these two parameters in people with type 2 diabetes. Pharmacodynamic profile (glucose infusion rate) of BioChaperone Combo 75/25 and Humalog Mix 25 for 30 h after injection in 24 subjects with type 2 diabetes under euglycemic clamp conditions (NCT#02514850). 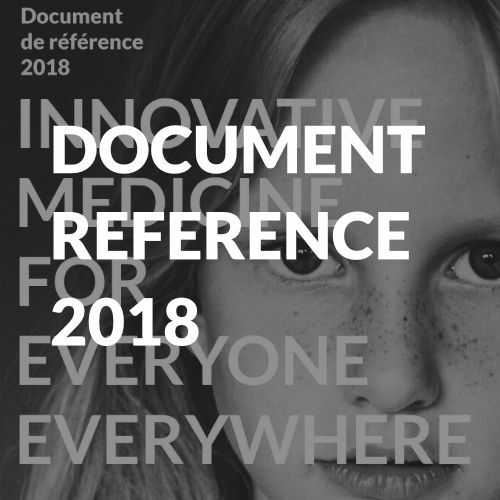 In June 2017, Adocia announced the positive topline results for a study intended to measure the effect of BioChaperone Combo injected at mealtimes on postprandial glycemic control in patients presenting type 2 diabetes compared to that obtained with Humalog® Mix25™ premixed insulin (Eli Lilly), and with separate injections of Lantus (Sanofi) and Humalog (Eli Lilly). 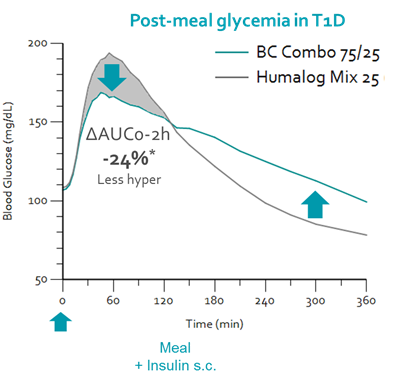 In this study, BioChaperone Combo confirmed a similar efficacy on postprandial control in people in type 2 diabetes to that observed in people with type 1, showing a statistically significant decrease of 18% in glycemic excursions for the first two hours after the meal compared to Humalog® Mix25™. The number of hypoglycemic episodes per patient was also significantly lower with BioChaperone Combo than with Humalog® Mix25™. Moreover, BioChaperone Combo led to at least as good postprandial glycemic control as that achieved with simultaneous and separate injections of Lantus and Humalog, and a similar number of hypoglycemic episodes per patient. Phase 1b clinical results – BioChaperone Combo dose-proportionality study in people with type 2 diabetes. In January 2018, Adocia announced positive topline results for a Phase 1b study evaluating the relationship between insulin exposure and hypoglycemic response to the BioChaperone Combo 75/25 dose for three different doses in people with type 2 diabetes. BioChaperone Combo exhibited dose-proportional exposure and a linear relationship of hypoglycemic response to the dose when tested at 0.6; 0.8 and 1.0 IU/kg in people with type 2 diabetes. These results are essential to complete the regulatory dossier. The study also confirmed previous results showing that BioChaperone Combo acts significantly faster (prandial effect) and lasts significantly longer (basal effect) than Humalog® Mix25™. In April 2018, Adocia and Chinese company Tonghua Dongbao announced a strategic partnership to develop and commercialize BioChaperone Combo and BioChaperone Lispro in China and other Asian and Middle East territories. In China, 65% of insulin is sold in the form of premixed insulin, and BioChaperone Combo could present significant medical benefits over those products. In June 2018, Adocia further announced two additional agreements with Tonghua Dongbao whereby Tonghua Dongbao would supply Adocia with insulin lispro and insulin glargine globally (with the exception of China), enabling Adocia to advance its key BioChaperone Combo and BioChaperone Lispro programs and to diversify partnership opportunities. Adocia retains the rights to develop and commercialize BioChaperone Combo and BioChaperone Lispro in the US, Europe, Japan and Latin America.